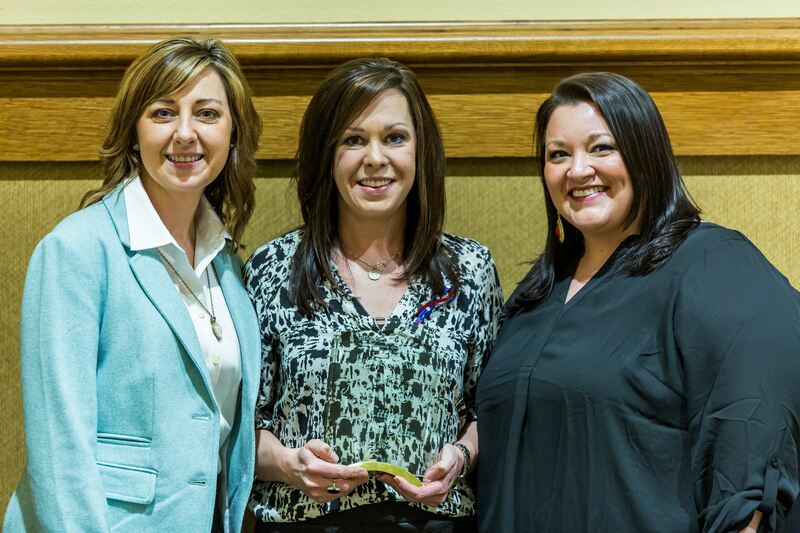 The Arkadelphia Alliance and Area Chamber of Commerce named Nicole McGough, 7th grade teacher at Goza Middle School, Citizen of the Year at the 2016 Chamber Banquet on March 10. McGough was born in Maine and raised in New York. She received her bachelor’s degree in elementary education from Saint Bonaventure University. Upon graduation, McGough moved to Texas, where she worked as a hall director and began her master’s degree at Lamar University. After meeting Cris, McGough’s husband, she relocated to Arkadelphia and received her master’s degree in special education from Henderson State University. McGough is an active member of the Arkadelphia community. Through her membership with Junior Auxiliary, she helps with several events including Camp Kaleidoscope and Backpacks for Kids. She is serving her fifth year as co-chair of Clark County Angel Tree, which provides Christmas gifts for over 500 children in Clark County. McGough is president of the Arkadelphia Running Club, where she helps plan several local 5Ks for community groups including Junior Auxiliary, Group Living and the Chamber of Commerce. She is also serving her 11th year as a CASA volunteer, working closely with Karrie Goodman, the executive director and Arkadelphia’s Board of Education secretary. "Nicole's passion and personal drive to serve others leaves me speechless,” Goodman said. “Her advocacy for the countless children in our local foster care system has literally changed lives. CASA is blessed to have her on their team, and I am so thankful for her and all that she does for children." McGough has taught at Goza Middle School for 16 years. For the first six years at Goza, she taught special education, then moved into regular eighth grade math. McGough and her family relocated to New Jersey, where she taught eighth grade algebra for one year before returning to Arkadelphia. McGough now teaches seventh grade advanced math and serves as a Goza representative in many extracurricular activities. When Goza Middle School started a Relay for Life team, McGough, a cancer survivor, wanted to help out. She took over as Goza’s team captain the second year and is now in her third year of being the event chairperson for Clark County’s Relay for Life. McGough has two daughters currently enrolled in Arkadelphia Public Schools. Many times, the two accompany her at meetings and help with special events. During Christmas time, they help bag items and tie ribbons to the tags that Junior Auxiliary hangs on the Angel Tree. She also includes them in her Relay for Life activities. In addition to encouraging her own children, McGough spoke to a group of Henderson State University students this past January about her personal volunteer work and gave them advice about getting involved. Arkadelphia Public Schools is proud of Nicole McGough’s commitment to not only our district, but to Clark County.